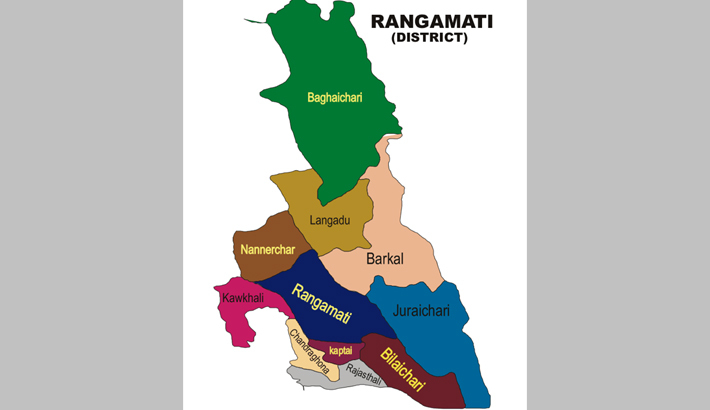 RANGAMATI: The former state minister for Chittagong Hill Tracts and Awami League leader, Dipankar Talukdar, on Tuesday urges the local people in Naniarchar upazila to launch massive resistance against the illegal arms holders in the area, reports UNB. The AL leader came up with the compulsion while inaugurating Bangamata Fazilatunnesa Smriti Bhaban at AL office in Naniarchar upazila. The condition may deteriorate further in Hill Tracks, if proper steps were not taken against the illegal arms holders, he said. “They are unsettling the peace of Hill Tracks with arms”, he added. Naniarchar upazila AL President Tridib Kanti Dash, Chittagong Hill Tracts Regional Council member Kamal Uddin, District Council chairman Brish Ketu Chakma, General Secretary of district Awami League Hazi Mosa Matobbar also spoke among others on this occasion.